On the other note, I was really shocked that today is Friday already… I’ve spent good amount of time to study and play with studio light, and must admit that I never felt myself such a DORK :0) Yes, I completely understand that photography is a very amazing, serious and kind of magic art and requests great knowledge, skills, practice (not to mention that talent and passion is a MUST!!) And this is why I procrastinated such a long time. But since I always (and pretty often – right now!!) need pictures of my designs (and possibly in one style for a collections or even for a book), I decided to make a try. And you know what?! I really was so amazed by shades-world and how light “works” at all! Well, I must to say that never paid enough attention to these things. For outdoor pictures, I have a couple spots in our backyard and know that at a certain time and weather I can get not bad pictures, which will show texture and “volume” or crochet and knitted stuff perfectly. But oh my, you don’t want to know how many time was spend to do something similar in studio with strobes… Well, these pictures is what I’ve got so far. I still hate the dark shades on the floor and probably backdrop should be separated better, as well as contrast/white balance is not correct …and a composition is another thing to study. 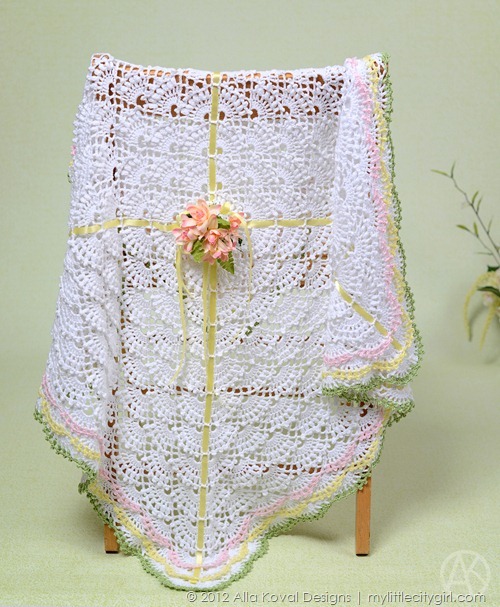 Give Baby the sweetest of sleep and the best of dreams with this soft as sakura petals and unbelievably luxurious afghan. Delicate crochet shells come together to create billows of heavenly softness, just right for Baby’s delicate skin. It’s a perfect gift for boys and girls alike — just trim it in blue, pink, or any color of your choice, and watch little eyes grow wide in delight before Baby snuggles into the clouds for a nap! that is gorgeous Alla!! I love the “lacy-ness” look of it. It almost looks like a present! It looks like a big hug of love, and totally cute for a gift!!! Oh, and I now LOVE “Hug of Love” as name better than Sakura. We definitely need a contest ;) I’ll start one next week! 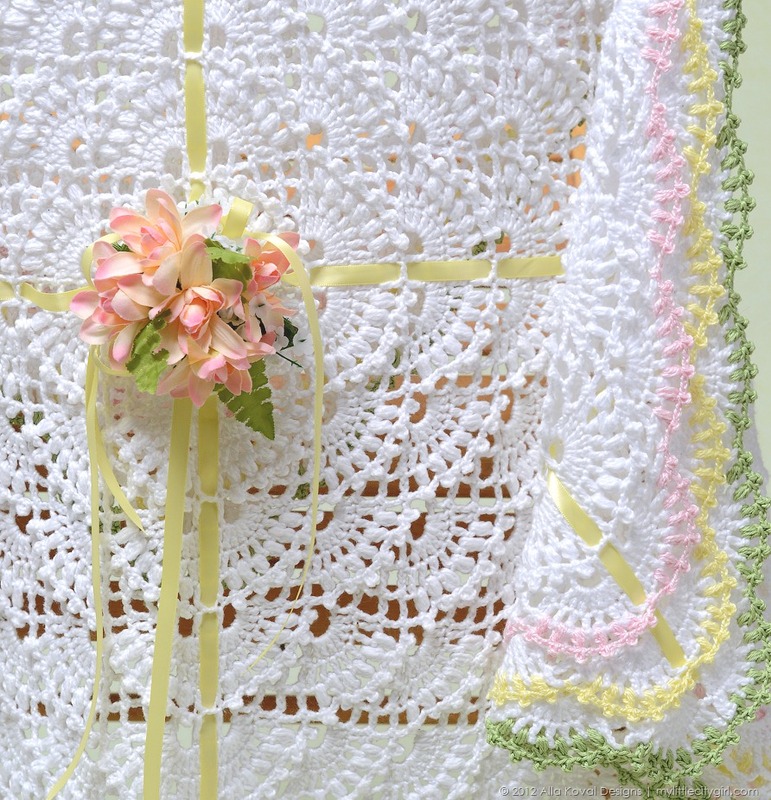 just saw your crocheted baby blanket – hugs of love – for the first time. it is beautiful. is it possible to get the pattern to it? I would love to make one. If you do have a pattern please let me know how to purchase one. Thank you so much for your interest. 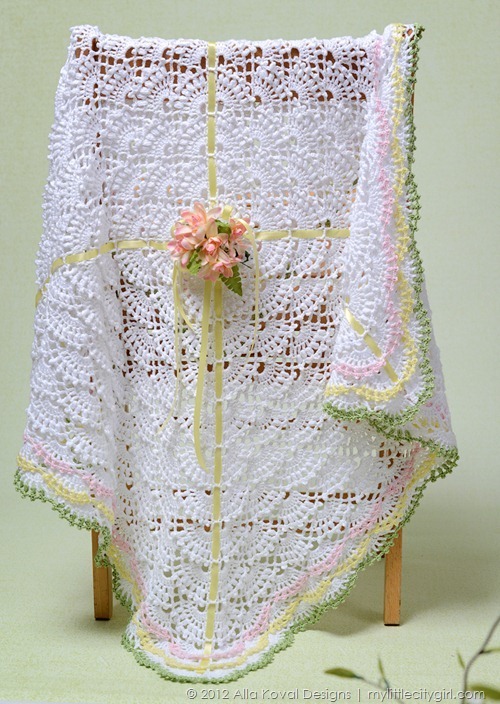 My patterns are available for instant download in these stores: myShop, Etsy and Ravelry. 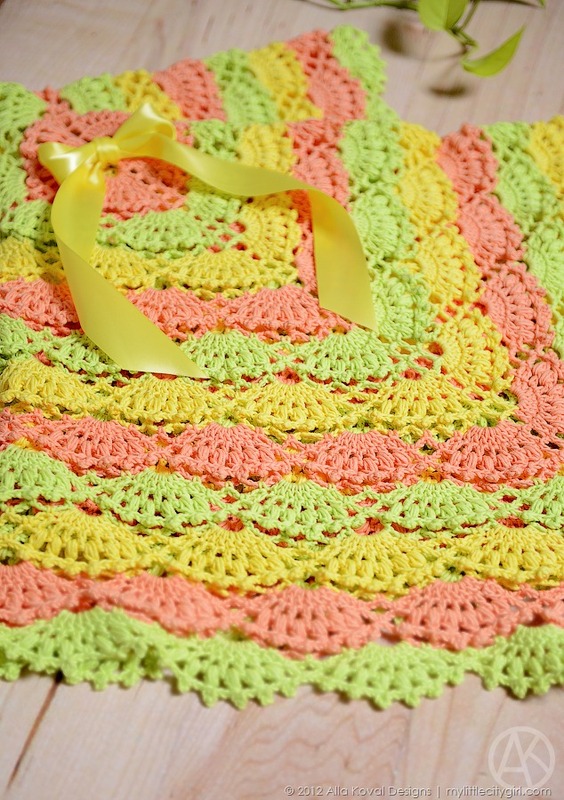 Also this pattern included in my Imagical Seasons Spring crochet book. Please feel free to email me with any questions you may have.